There are the Titans, the Furies, the Sirens. The Greek goddess of health was Hygieia, from whose name we get “hand-sanitizer”. Nemesis has come to mean “archrival” or “unbeatable opponent”, as in “Phillies pitcher Roy Halladay is the nemesis of the Cincinnati Reds.” The orginal Nemesis was a Greek goddess who dealt out justice, or vengeance, to the wicked. Our word hypnosis is derived from Hypnos, the personification of sleep. Then there’s Psyche, who started out in Greek legend as a king’s daughter and came to be associated, through a complicated tale, with the human soul, and by extension, the mind. Tantalus was a son of Zeus who was punished for revealing secrets of the gods to mere mortals. His punishment was to stand in chin-deep water, but when his thirst compelled him to drink, the water receded just out of reach of his mouth. In other words, Tantalus was tantalized. As you know, there was a lot of treachery and back-stabbing going on among the Greek deities and their underlings. Echo was a nymph who was given the task of distracting Zeus’s wife Hera while he rendezvoused with his various mistresses at the Mount Olympus Hilton. Echo’s strategy was to talk incessantly, but eventually Hera stopped listening and figured out what Echo had been doing. Hera punished her by altering Echo’s power of speech — she could only repeat the last thing that someone else said. Echo also figures in the story of Narcissus, who is the patron saint, so to speak, of reality-show performers. Our word narcissism, which means “inordinate fascination with oneself; vanity”, is derived from Narcissus, who found himself utterly irresistible. According to the legend, he was a good-looking guy and Echo fell hard for him, but she placed a distant second in his affections — he was too busy admiring his own hunky reflection in a pool. As one version has it, Echo was so distraught at his rejection of her that she cried until nothing was left but a trace of her voice. 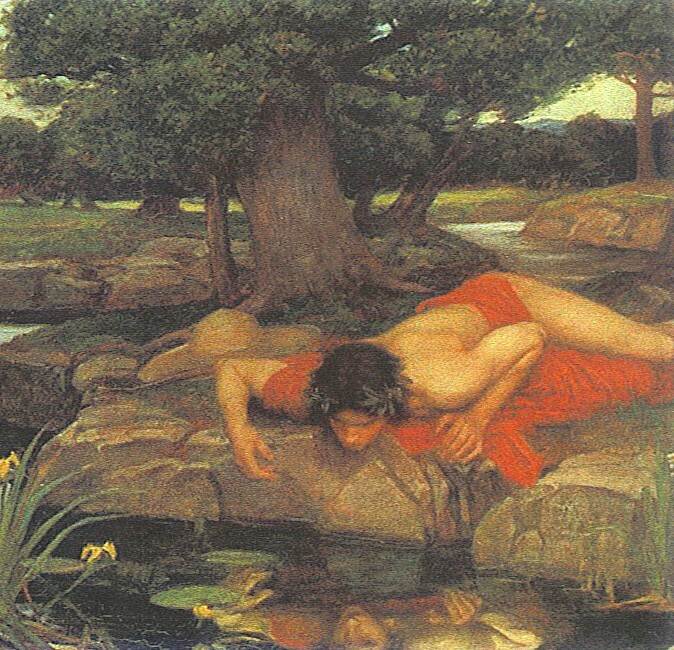 Narcissus eventually died of frustration because he couldn’t have a satisfying relationship with his own reflection. But what could he do — that face in the pool was just too beautiful for words. This entry was posted in Language and Literature and tagged Echo, Greek mythology, Hypnos, Narcissus, Tantalus. Bookmark the permalink.